(WASHINGTON)— “Congress: Fix Our Infrastructure Problem Now.” That’s the key message of a new ad campaign urging Congress and the Trump administration to develop and pass this year a robust transportation infrastructure investment package and a permanent fix for the Highway Trust Fund (HTF). The ad campaign, developed by the Transportation Construction Coalition (TCC) and Americans for Transportation Mobility (ATM), begins today with an opinion piece in Politico asking the nation’s leaders for a renewed commitment to “invest financially in America’s transportation infrastructure.” The piece also features digital ads that connect to the TCC’s website. Priority 1: Provide an expanded and sustainable way to pay for future Highway Trust Fund supported investments that keep pace with our Nation’s growing infrastructure. Priority 2: Expand Trust Fund resources for projects that ease traffic congestion, improve safety and support long-term economic growth. 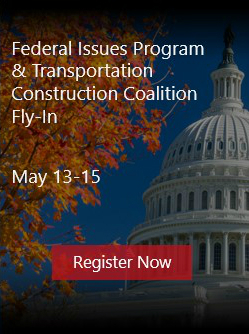 Established in 1996 and co-chaired by the American Road & Transportation Builders Association (ARTBA) and the Associated General Contractors of America (AGC), the 31 associations and labor unions that make up the TCC have a direct market interest in the federal transportation program. A complete list of members can be found at: www.transportationconstructioncoalition.org. The Americans for Transportation Mobility (ATM) coalition was established by the U.S. Chamber of Commerce in 2000. It brings together businesses, the labor and union sectors, transportation stakeholders, and the public to advocate a robust transportation infrastructure grid in the United States. This includes promoting ongoing and sustainable funding through policies and broad-based initiatives.